Star Wars and Lego LEGO and Star Wars are together again with five complete episodes that awaken the lighter side of the force in LEGO® STAR WARS: Droid Tales on DVD March 1st! It includes an Exclusive trading card set packed inside each DVD! The Story picks up just after the victory celebration in the Ewok village on Endor at the end of “Return of the Jedi" , as R2-D2 and C-3PO have gathered to entertain the Rebels with the tales of their adventures. An accidental kidnapping occurs while the droids are story weaving, and suddenly you’re taken on a new journey that leads to the retelling of the entire Star Wars saga, as told by R2-D2 and C-3PO! Eric Bauza (Spongebob Movie, Ben 10: Omniverse, Batman: Assault on Arkham) as Luke Skywalker/Porkins Pilot; Michael Daingerfield (Ace Ventura: Pet Detective, Catwoman) as Han Solo/Admiral Ozzel/Biggs Pilot; Anthony Daniels (Star Wars Franchise) as C-3PO; Trevor Devall (Kid vs. Kat, Johnny Test) as Emperor Palpatine/Admiral Piett/Admiral Ackbar. Purchase Lego Star Wars: Droid Tales on Amazon for $12.99 & FREE Shipping on orders over $49. 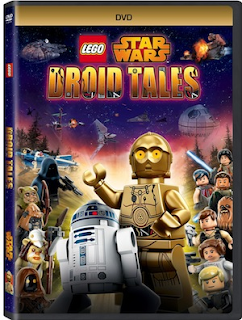 This DVD combines two of my son's favorite things, LEGO and Star Wars. He has a number of Star Wars LEGO sets, so of course was excited to watch this DVD! The Lego Star Wars Droid Tales is fun for the whole family, it has the classic Star Wars characters, but in LEGO format. It it a fun and light series for kids, they will giggle and love each and every episode. I personally loved the Jawas! They are the best!